DBHPS Exams 2018 - Dakshin Bharath Hindi Prachar Sabha Conducts Hindi Examination for all candidates all over India twice in a year. DBHPS Exams are conducted in the month of February and in the month of August. For Parichay, It is conducted in the month of January and in July. DBHPS Exam results are published in 2by2results.com as well as dbhpscentral.org. 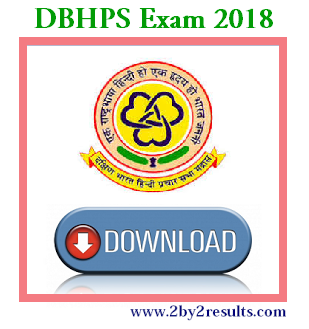 you can download DBHPS Question Papers, DBHPS Important Questions & Essays for your Exams from our website. DBHPS has planned to conduct the Hindi Exams on the following dates are given below. Exams are conducted only on Saturday and Sunday and DBHPS Exam Hall tickets are available in online to download and also they are sent to the postal address as well. Hall Ticket is mandatory to attend the DBHPS exams.